Microsoft Pledges $500 Million Investment To Tackle Affordable Housing Crisis Most of the money will help preserve and build new homes for low and middle-income residents. A smaller portion will go toward homeless services and programs to keep people from being evicted. Brad Smith, president of Microsoft Corp., speaks during a presentation on affordable housing in Bellevue, Wash., on Thursday. Microsoft Corp. said it will spend $500 million to develop affordable housing and help alleviate homelessness in the Seattle area. Microsoft is investing $500 million to help develop affordable housing and address homelessness in the Seattle area as the growth of tech companies in the region continues to flood the real estate market with high-salaried workers, leaving many other people behind. The software company made the announcement Wednesday, explaining that the windfall will be distributed over the next three years. Most of it will go toward preserving and building new homes for low- and middle-income residents. A much smaller portion will immediately go toward homeless services and programs to keep people from being evicted – as of a count conducted in January 2017, the city recorded more than 11,500 homeless residents. 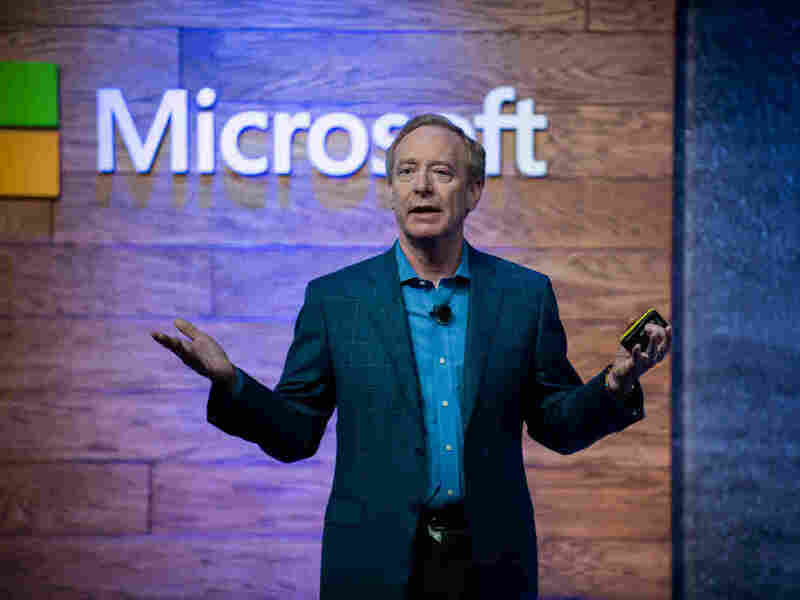 "The housing situation in the Puget Sound region has reached a point where it's appropriate to use the word 'crisis,' " Microsoft President Brad Smith told NPR member station, KUOW, on Thursday. "The lack of available housing is forcing many people — the schoolteachers, the nurses, the first responders, many others who work at companies — to endure longer and longer commutes. And we have even far worse problems for people who are homeless," Smith added. Research by Microsoft found that job growth has outpaced housing construction at such a rapid pace, the company said, "This gap in available housing has caused housing prices to surge 96 percent in the past eight years, making the Greater Seattle area the sixth most expensive region in the United States." Smith noted the long-term aim of the company, which is headquartered in the Seattle suburb of Redmond, is to ensure lower- and middle-income workers can continue to live close to where they work, instead of being priced out. "I think when you take people who play vital roles in a community and you force them to live in another community it really saps the vitality for all of us," Smith said. The company will offer $225 million in low-cost loans to subsidize the preservation and construction of middle-income or "work force" housing in six cities – Redmond, Bellevue, Kirkland, Issaquah, Sammamish and Renton – where the company has more than 50,000 employees. The resulting residences will target households making between $62,000 and $124,000 per year. Another $250 million in market rate loans will support low-income housing throughout King County. These are intended for households earning 60 percent of the local median income – about $48,000 for a two-person household. And $25 million in philanthropic grants have been allocated to tackle homelessness in the greater Seattle region, including a $5 million dollar grant to Home Base, a program created by the Seattle Mariners, the King County Bar Association and the United Way of King County, to provide legal aid for people facing evictions from their homes. The pledge comes as Microsoft plans to expand its presence in the area by another 8,000 employees. The Seattle Times reported the software company is adding about 2.5 million square feet in new construction to the Redmond campus and plans to renovate another 6.7 million square feet. According to Microsoft, it began working on the plan eight months ago, which means it preceded the Seattle City Council's failed head-tax effort last year. The proposed tax would have required big businesses to help fund affordable housing and homeless services. But Amazon, the city's other tech giant, was instrumental in killing that effort. Microsoft's endeavor to ameliorate the housing crisis dovetails with a recent pledge by the mayors of nine surrounding cities to take concrete steps to increase the supply of quality housing. Among the changes they're looking to implement are changing zoning and land use regulations to increase density near public transit, streamlining and accelerating the permitting process for low- and middle-income housing developers, and providing tax incentives to encourage such developments. Smith and Microsoft's Chief Financial Officer Amy Hood said in a blog post they are hopeful other companies will also work with local organizations and city and state agencies to bridge the affordable housing shortfall. "Ultimately, a healthy business needs to be part of a healthy community," they wrote. "And a healthy community must have housing that is within the economic reach of every part of the community, including the many dedicated people that provide the vital services on which we all rely."